[BURMA 24.831] Searching for fish (1).	While the first sun-rays are piercing the haze over the Inle Lake, an Intha fisherman searches the lake for a catch. Photo Mick Palarczyk. [BURMA 24.805] Stilted house.	View from one of the stilted houses of Maing Thauk, a village in the Inle Lake 5 km south of Nyaungshwe. Photo Mick Palarczyk. 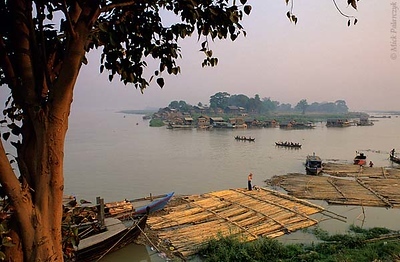 [BURMA 25.069] The Irrawaddy at Mandalay.	Standing on the embankment of the Irrawaddy in Mandalay, one can see inhabitants of a nearby village crossing the river to visit the city. The river-landscape seems to be totally unaffected by the nearby agglomeration. Photo Mick Palarczyk. 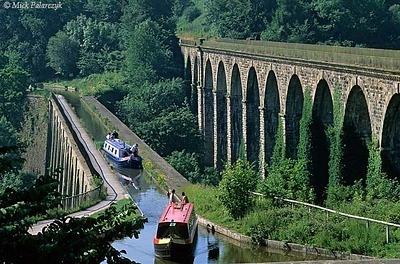 [BRITAIN.WALES 22.299] Chirk aqueduct.	The Chirk aquaduct, finished in 1801, takes the Llangollen Canal from England to Wales. On the right is a later train viaduct. Photo Mick Palarczyk. 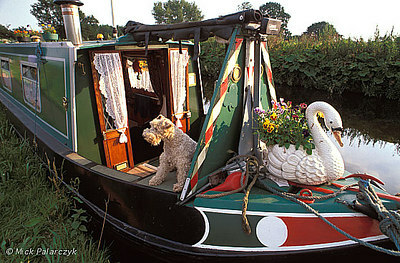 [BRITAIN.ENGMIDDLE 22.220] Boat menagerie.	Modern owners of narrow boats enjoy decorating their vessels just as much as their 19th. century predecessors, as can be seen here on the Staffordshire & Worcester Canal near Bratch. Photo Mick Palarczyk. 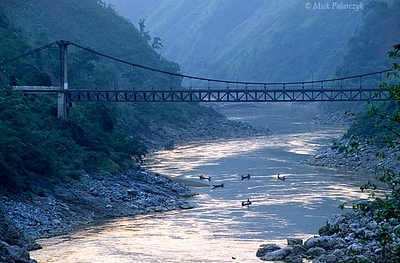 [VIETNAM.NORTH 21.373] Bridge across the Da River.	The Hang Tôm suspension bridge crosses the Da River north of Lai Châu. Photo Mick Palarczyk. 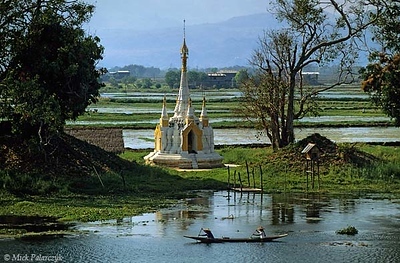 [BURMA 24.820] Pagoda near Nampan village.	At the Inle Lake near Nampan village a narrow strip of land carries an enchanting pagoda. In the background shimmer the mountains of the Shan highlands. Photo Mick Palarczyk. 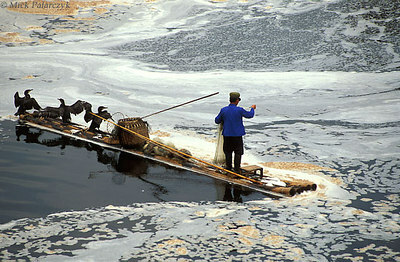 [CHINA.GUANGXI 25.391] Cormorant-fisher.	South of Yangshuo a fisher on the Li River makes use of trained cormorants. The birds are not able to swallow caught fish as a result of a cord which is tightened around their neck. Photo Mick Palarczyk. 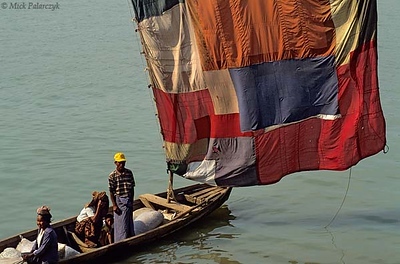 [BURMA 24.980] Sailing on the Chindwinn River.	At Monywa, a boat on the Chindwinn River carries a sail which has been sewn together from different pieces of colourful cloth. Photo Mick Palarczyk. 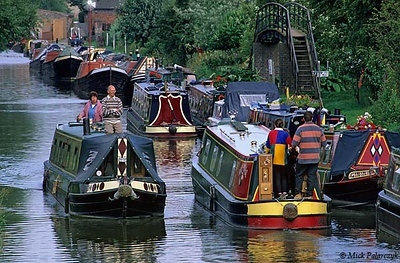 [BRITAIN.ENGMIDDLE 22.268] Grand Union Canal at Braunston.	The Grand Union Canal runs from London to Birmingham and has been the central highway of Englands inland water transport system for 200 years. Now it is mainly used for recreational boating. Photo Mick Palarczyk. 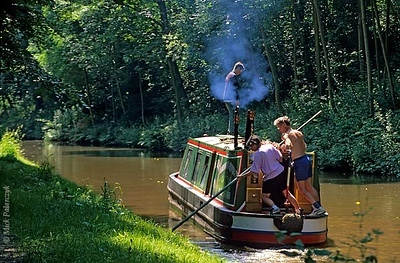 [BRITAIN.WALES 22.332] Run aground.	On the Llangollen Canal north of Chirk boaters can run into navigational problems. Freeing your narrow boat from the muddy canal bed can be an exhausting task. Photo Mick Palarczyk.